Jon and I spent our honeymoon in St. John, the best island in the Caribbean, in our opinion. We loved it so much and were lucky to visit for 2 days while in St. Thomas for Jon's work trip a few years ago. Those 2 days gave us the itch to go back, so we returned for a belated 5th anniversary trip last year. Everything about the island is amazing - the laid back atmosphere, the crazy roads, the protected national parks, the beaches, the views you catch when driving in your rental jeep - absolutely breathtaking, the waterfront bars and restaurants, and the feeling you get when you are on the island - I could honestly go back every year and would never be bored. While there we enjoyed dinner at Chloe and Bernard's, the Westin's restaurant. 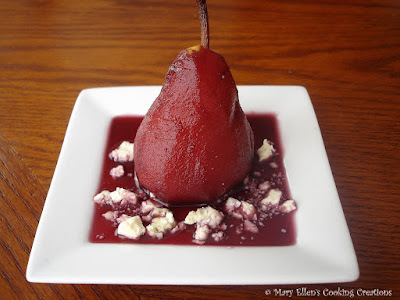 I ordered the red wine poached pears with double cream brie, and loved it so much that I have been wanting to make the pears ever since. 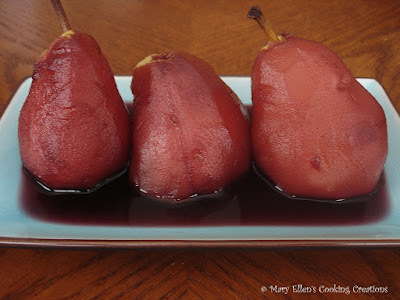 So last week when I had a few pears that needed to be eaten, I decided to give them a try. I wasn't sure what else was used as the poaching liquid besides red wine, so I turned to this recipe for help. Coring the pears was easier than I thought, especially since I don't have a corer. I took a potato peeler and inserted it into the bottom of the pear, went around the core, and pulled it out. The core came out easily and I cleaned it up a bit with a small measuring spoon - 1/4 teaspoon to be exact. Once cored, I put them in a bowl of water with a touch of lemon juice while I prepped the poaching liquid. In a large pot over medium heat, bring with wine, lemon juice, sugar, and cinnamon to a boil (make sure you use a pot that is deep enough for the liquid to cover the pears once you add them). Add the pears to the poaching liquid, making sure they are covered. 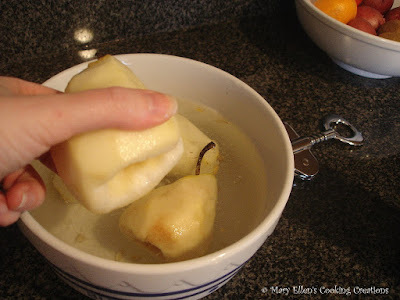 Slowly simmer the pears, loosely covered, until they are soft, but not mushy, when poked with a sharp knife. Remove from the heat and allow to cool in the syrup to lukewarm. I stored the pears in the fridge for a few hours. Once ready to serve, I put them on the stove over low heat to bring them back to lukewarm. I served them with crumbled blue cheese. I see this dish a lot as a salad or starter, but I decided to serve them as dessert. I loved them, and they were so easy to make, but looked impressive on the plate.